The tomato may just be my favorite thing about summer. The French often refer to the tomato as the “pomme d'amour” or "love apple" and I can think of no other vegetable (or fruit, botanically speaking) that incites more amorous excitement or that I eat with more relish than a sun-ripened tomato. It has no prickly edges or tough skin to peel - you just eat it up, letting its juices run down your chin. Summer bliss! Along with peppers and eggplants, tomatoes are part of the notorious poison associated nightshade family. This has done little to thwart the tomato’s rise to culinary dominance. Originating in South America, tomatoes arrived in Europe, via Spain, in the early 16th century. Today they are found in almost every cuisine in the world and are as comfortable in an Italian pasta sauce as they are in a Mexican salsa or even a South African tomato bredie. Not only do tomatoes contain carotene lycopene, one of the most powerful natural antioxidants, but the beta-carotene in the flesh also helps protect your skin from sun damage. These are only two of multiple health related reasons you should be eating this super-fruit. There are thousands of tomato varieties, varying in size from the bulky beefsteak to the cherub-like cherry tomatoes, but they all share a sweet, gently tangy flavour and are delicious - raw, sundried or cooked. So with the ripe anticipation of summer in the air I give you three beautiful, quick tomato recipes to serve to your guests as a light snack on a summer’s evening. These fritters, covered in a crispy, golden batter with a sweet, tangy centre, are perfectly complimented by a fresh basil aioli. Perfectly toasted ciabatta, rubbed with fresh garlic and topped with sweet cherry tomatoes, torn basil leaves and a good glug of extra virgin olive oil. 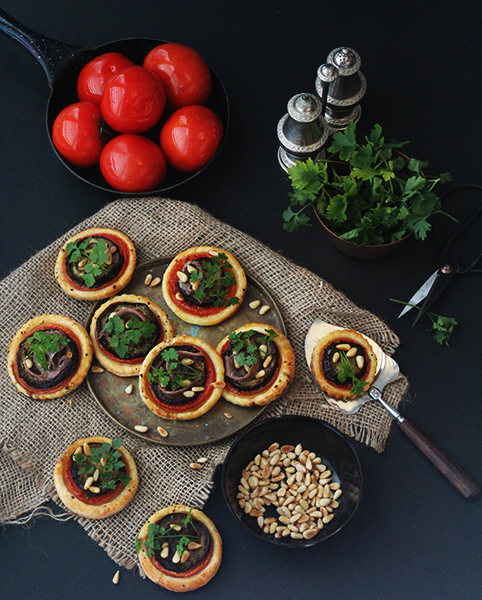 Light layers of buttery puff pastry topped with creamy roasted aubergine, ripe red tomatoes, salty anchovies, toasted pine nuts and a sprinkling of fresh Italian parsley.